This landmark is located at Krug Ranch, 2800 Main Street, St. Helena, California. There are 16 other California State Historical Landmarks in Napa County. 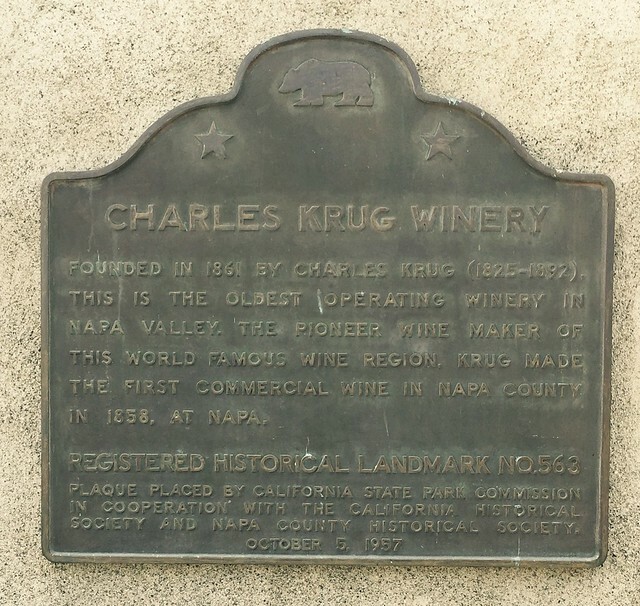 The GPS coordinates for this location are 38° 31' 05.7" N 122° 28' 56.1" W.
Founded in 1861 by Charles Krug (1825-1892), this is the oldest operating winery in Napa Valley. The pioneer winemaker of this world-famous region, Krug made the first commercial wine in Napa County at Napa in 1858. Charles Krug, a Prussian Immigrant with controversial political beliefs for which he was briefly jailed, finally arrived in San Francisco in 1852. He likely came with no grape-growing or winemaking experience, but his insight, thirst, and inherent understanding that premium wines are made from European grape varieties inspired him to take the lead in advances in winemaking. Innovations such as using a cider press to efficiently crush the grapes, planting insect-resistant rootstock, and establishing the first public tasting room, truly made him a founding father of the pioneer Napa Valley wine industry. 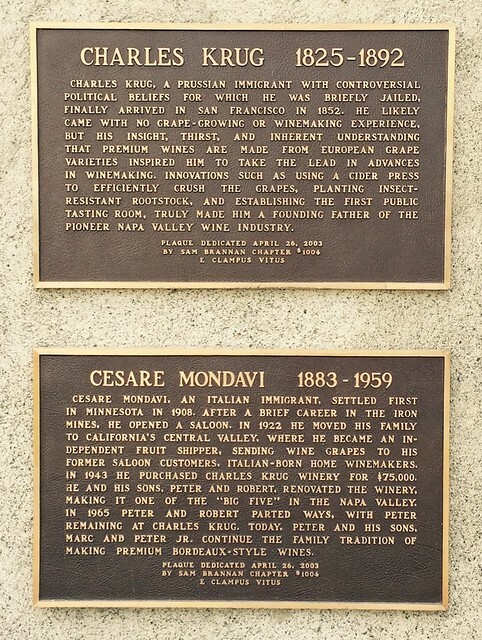 Cesare Mondavi, an Italian immigrant, settled first in Minnesota in 1908. After a brief career in the iron mines, he opened a saloon. In 1922 he moved his family to California's Central Valley, where he became an independent fruit shipper, sending wine grapes to his former saloon customers, Italian-born home winemakers. In 1943 he purchased Charles Krug Winery for $75,000. 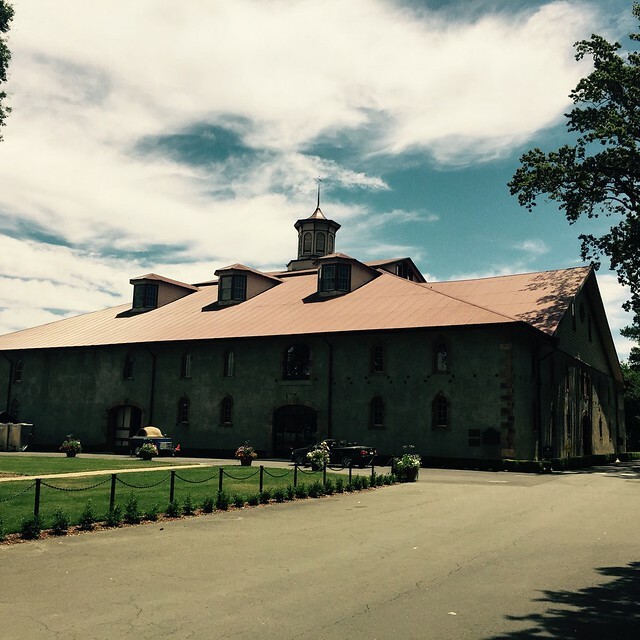 He and his sons, Peter and Robert, renovated the winery, making it one of the "Big Five" in the Napa Valley. In 1965 Peter and Robert parted ways, with Peter remaining at Charles Krug. Today, Peter and his sons, Marc and Peter Jr., continue the family tradition of making premium bordeaux-style wines.